That's really an important incident of my life. I did not remember the exact date, but that was end of May, 2005. I had a one month training at the Indian Telephone Industry (ITI), K. R. Puram, Bangalore when I was at the threshold of my last year of B.Tech which I believe, was a total wastage of my life of 4 years. I hardly learned anything in my graduation. Now sometimes I wonder why I did go for B.Tech. Don't worry. This is not only my story of disliking B.Tech in spite of being an engineer, but probably 60% of the millions of engineers India produces per year. What to do? you need a job after all. And being an Engineer, helps you learning the process of minimum labor and maximum success. Let's close the matter here. Someday, I will write in details about Engineers' Story in India. I was returning to Calcutta via Chennai in a 2nd class AC compartment of Chennai-Howrah Mail (I had no money to travel in flight those days, that ticket was my father's railway pass) . I reached Chennai from Bangalore in the morning of that very day and spent my whole day at the residence of a family friend, K. Nandagopal before boarding from Chennai. Nandagopal spent his whole service life in Calcutta working for Eastern Railways; after retirement, he and his family shifted to their native place, Chennai. My father was also in Eastern Railways and that's how we knew him and his family; we still have a very cordial relationship. I had still remembered, Nandagopal used to roam about in Chennai on his green scooty and that scooty carried me to Chennai Central station from his residence that day. Anyway, The train started from Chennai in the evening; had my supper and I slept in my upper berth. Hope you know, what problem you are going to face if you are traveling in upper berth in Indian rail and by mistake if you wake up early in the morning. The fellow passengers in the lower berths will surely sleep little more than their usual timings and you have to sit on upper berth and wait till others will feel little pity for you. I got down and moved to the next coup with the hope that if I could have a seat there. I found that only a foreigner is sitting beside the window in a lower berth and reading a book. All other three berths were still occupied by the Kumbhakarnas in that coup. I asked him for allowing me. He did and I sat on his berth. No conversation for a long time and suddenly I could not resist myself from asking him about the book he was reading. It was a Quran translated in Latin. I was surprised, a person from west reading Quran. I became very curious about the person. He introduced himself, Eduardo de Almeida Navarro, a Professor of Portuguese and Brazilian literature at the University of Sao Paulo, Brazil. He was doing a research and field work on St. Thomas. How St. Thomas came to India, which places he visited, his activities in India etc. Eduardo followed St. Thomas starting from Goa, through the western coast in Kerala and reaching Chennai. He wanted to conclude last part of his research by St. Thomas' activities in Calcutta. Our coversations started and it did not end. We discussed a lot of literatures, linguistics trough out the day, had lunch and supper together. Discussed a lot about Rabindranath Tagore and Swami Vivekananda. I was very pleased knowing his enthusiasm and love for Indian Literature. We shared very beautiful words which we use in both of our mother tongues i.e. in Bengali and in Portuguese. That particular day in train I will cherish, always. Every good moment, good conversation always ends very quickly. I aked him to visit Jorasanko, Tagore's home in Calcutta and he went. He was not much interested staying in 5 star hotels; I asked him to stay at the Park in Park Street, Calcutta 16 (I have some fascination about the street, will write about it sometimes) , he did. We decided to meet and had lunch during his stay in Calcutta, but both of us could not manage time. After Eduardo returned to Brazil, we started writing letters (not emails). Those letters were actually some good pieces of writings from Eduardo. We shared the current situations of both Brazil and India, about our societies, about new books, literatures, about the sudden changes in the developing countries because of globalization etc. 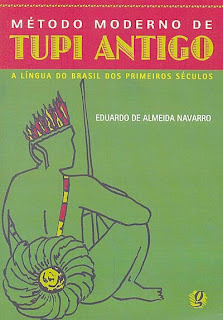 And suddenly one day, I got a letter from him where he wrote that he has just finished writing a book named Metodo Moderno de Tupi Antigo in Portuguese and the book is dedicated to me. I still wonder why did he dedicate me the book but surely that is the biggest honour I achieved so far. The book was about a very old language of Brazil called Tupi. Life became busy for me. I shifted to Mumbai in 2008. Frankly, today I really don't get much time to sit and write letters. After 2008, Eduardo visited Mumbai twice but he had to move to Daman for his research work. We had conversations over phone while he was in India, but could not meet him personally. Now I am really looking forward to meet him during his next trip to India.